The Carolina wren birdhouse has a larger entrance hole than other wren boxes. Therefore it is also open to other wrens, chickadees, nuthatches, swallows, house sparrows and more birds. Make the floor 4″ by 4″ (inside dimensions) and an 8″ floor to ceiling height (inside front). Cut a 1 1/2″ diameter entrance hole located 6″ above the floor (to top of hole). Drill or cut ventilation openings in the floor and under the roof. Make this box with red cedar, pine, or almost any soft wood. Use rough-cut wood on both sides so birds can grip interior and exterior surfaces. 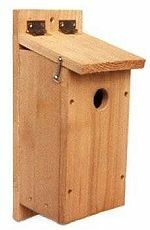 Mount this nest box in forests, groves or yards on trees, posts, possibly fences or walls with partial sun and shade between four and twelve feet high. At least out of reach is best to deter the curious unless the box is well concealed. Also see the Carolina wren species page. Drill countersunk pilot holes in primary pieces. Drill regular pilot holes in secondary work pieces. This reduces a tendency for wood to split. It makes for easy assembly in minutes with a power or hand held screwdriver.